Anyone else had weird experiences with this one? UPDATE (Oct.2, 09): How about next time I read the rules CAREFULLY... Each time an expansion action is taken, up to three hexes can be played NOT just one. Stupid me. I'm curious as to how these games will play out. 2-player? 5-player? Viciously competitive? Probably. 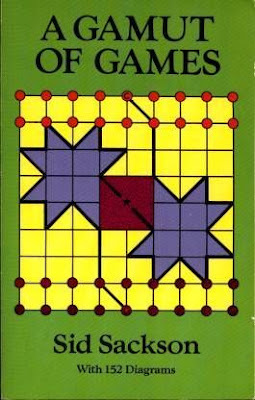 There are many books on the market that contain games but most just have the standards: card games, chess, checkers, etc. However, in the late 60's, prolific game designer Sid Sackson put out a book called 'A Gamut of Games'. Sackson is the inventor of, amongst others, the brilliant Acquire and is the father of modern boardgaming in my mind. 'Gamut' is a treasure trove, let me tell you. 38 original and fascinating games selected from his various gaming groups, 22 of which he invented himself. The book includes his classic abstract Focus before it was published and Soucie's brilliant Lines of Action (a personal favourite). As well, there is a precursor to Das Super-Blatt playable with a deck of cards and a game which is a bit like Monopoly and Acquire's love-child. Opening up the Dominion/Ticket to Ride-sized box yields a small deck of cards, a bag of wooden pieces, and a whole lotta cardboard. The wooden pieces are of the usual great quality and the cards are of fine stock. Then there's the cardboard: lotsa little chits with symbols on them and a big main board and player boards. I must say the art is very nice but not very evocative of world conquest. In fact, all of the art is VERY abstract. The main board consists of square sections which represent the different continents with rectangles representing the cities. It all looks very nice but nothing like a world map (except for the faint background pictures of the actual continents, something most players would barely notice). All of this is a complete non-issue for me but is indicative of a bigger problem others may have with this game. But overall, very well-produced and highly functional. Verdict: Very pretty but very abstracted. Not too much to say bad here. The rulebook is beautiful and has lots of great examples. We only missed one rule as it was in the margins, you know Alea-style. My bad for not reading it thoroughly. However, after one play through the rules of this game just click. The choices are simple and the game really makes sense so explaining it a second time is a snap (as long as your participants are willing...) Verdict: Beautiful, clear rulebook and simple, elegant rules. So how do you play? Well, each player starts with a player board with four rows of symbols. These symbols all have meanings (like technology and government or something like that) but they really don't matter that much. This game is so abstracted that you won't pay that much attention anyways. 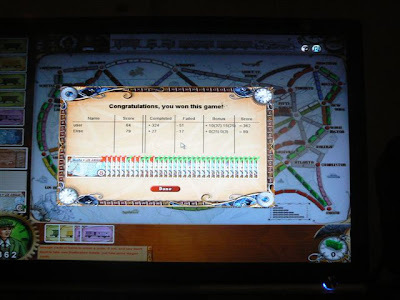 However, the major way one gets points in the game is from moving along these rows and the farther you move along them the more actions you will be able to perform. So, if nothing else, one wants to move along the rows on the player board and in some sense advance their civilization. But there is much more. In the game, there are seven rounds in total consisting of four phases each. In the first phase, everyone takes a building. No payment, just grab a building. However, you are limited on the building choices by where you are in your brick (technology?) row. Each building offers different but useful choices, many of which must be activated later. 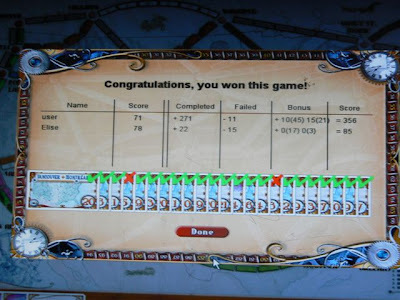 Some even allow you to increase a row on your player board or victory points at the end. An important note, though, is that unlike Puerto Rico these buildings are dead-simple to understand and consist of only a symbol or two. Consequently, building choices are usually quite fast. The second and third phases which usually occur at the same time are mere bookkeeping. 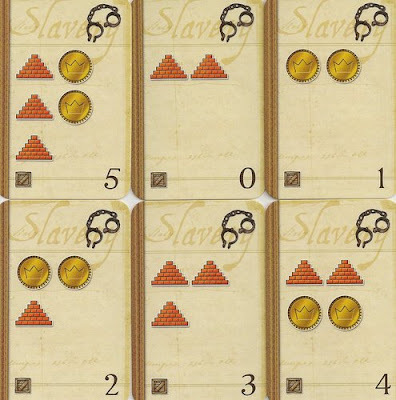 A player gets a certain number of their pieces from the general supply to place in their harbor and they can also remove a certain number of pieces from their buildings back to their harbor (both determined by how far along the player is on the corresponding rows of their player board). And then the real action begins. In the fourth phase players can begin to take actions with the counters in their harbor, usually by placing a counter on a building to activate it. There are only four actions that players can take, all of which are relatively simple. One can 'ship' by adding a counter to a shipping line leading into a continent. Shipping is important for when a shipping line completes, a continent is then considered open and other actions can be taken there. One can 'occupy' by placing a counter on an empty city in an open continent. At the beginning, only Europe and the Mediterranean is open. An 'attack' is also an option by tossing one counter into the general supply and then replacing an opponent's on the board. And finally one can pillage an open continent by drawing the top cards of the corresponding deck or decks as long as they have enough representation in the continent. These cards have nothing more than one of the four row symbols, allowing you to increase your player board rows, and the occasional victory point or two. Repeat seven times and you are complete. It's all very abstract and would make for a tedious game if not for the great little details added to the gameplay. When a continent opens, the person with the most counters on that shipping line gains a 'Governor' card, granting them quite the bonus. As well, each city is worth a point and so are connections between pairs of cities so suddenly getting adjoining cities becomes a lot more meaningful. As well each city and connection has a token on it, most of which let you AGAIN increase your rows and hence your capabilities. Other tokens can be played for an extra action of a certain type which is very useful as your actions are often limited by the number of your buildings. Even more interesting than that, one can choose to draw from a 'Slavery' deck but with possibly dire consequences. If a certain card is reached in another deck, slavery is abolished and those players who resorted to such unethical tactics lose points and all advantages given by the cards. All these little additions to a relatively simple set of rules make for one hell of a fun game. And because the symbology is so clear and the actions are so simple, turns end up being lightning quick. Much like Puerto Rico, one has longer-term goals in the back of their mind but in the short-term, play is quite tactical. Verdict: Brilliant, simple, and really quick. Having only played two games, I will admit I haven't plumbed the depths of this puppy. The major decisions stem from how one decides to increase their rows on the player boards and what buildings one takes during the first phase of each round. And, like any great Eurogame, each of these decisions are usually made from a small set of simple but valuable choices. Like Puerto Rico, each of these small decisions throughout adds up to make an overarching strategy. This brilliance follows through to the action phase, where the choices start small and expand as the game progresses. As players gain more buildings and hence more actions to choose from, certain areas of the board fill up. What happens then is that only two or three regions at a time seem open to occupation and pillaging and despite the large board the action remains very centralized at any one moment. But that doesn't mean the choices aren't tough - because they are - they just seem to resolve very quickly, making the game quick and very fun. As well, despite the simple rules, there are many chances for exceedingly clever moves and takeovers. At more than one point in our two games, a player was heard to say, "Damn!" or "Ouch. Well done..." Oh yeah, and once the chips are laid out at the beginning this is a game of perfect information. Nice. Verdict: Long-term strategy a beginner can grasp with continuous tactical decision making throughout. Perfect information. So great. As you can tell, I'm loving this game. The rules make sense and are fairly easy to understand and explain (although, it's NOT Ticket to Ride). In sense of complexity, I'd put the strategy one notch lower than Puerto Rico... but not much lower. In terms of feel of play, I can't think of any other game that this reminds me of. It's original, highly interactive, and loads of fun. 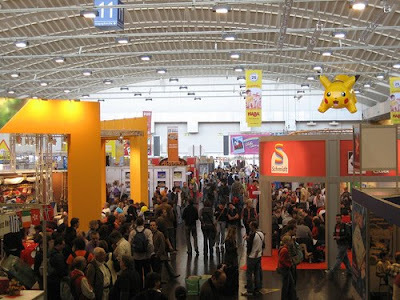 A thing to note, though: I LOVE Eurogames and don't mind abstraction. 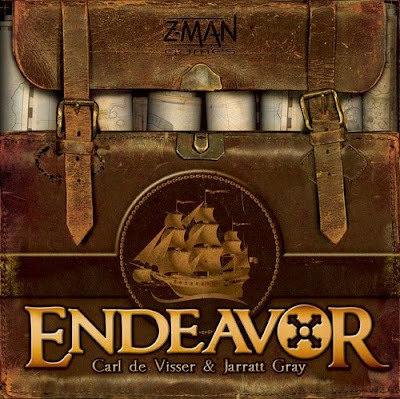 But the theme of Endeavor feels more abstracted than even Tigris & Euphrates or Acquire. This would be a negative if the game didn't play so well. 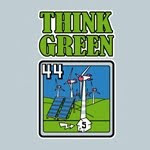 Check out the T-shirts at www.gameink.net for the ultimate geek gifts. Some of these are pretty obscure like my favourite, "They call me... El Grande!" Great, simple little game that managaes up to six people. Move stones, collect different types of fossil pieces, and score big when all of that type is taken. Easy rules, but more than meets the eye. Lags a little at the end but still fun and so easy to teach. Okay, the hype is worth it. A wonderful, complex game with relatively simple rules. This has been getting great press and it deserves it. The theme is about world conquest but the play is surprisingly abstracted. And yet, this game is a ton of fun and the interaction is fierce! It has been compared to Puerto Rico but after having played it, the resemblance is pretty minimal. Pick up chits with symbols, move corresponding rows, and place markers on cities on the board. 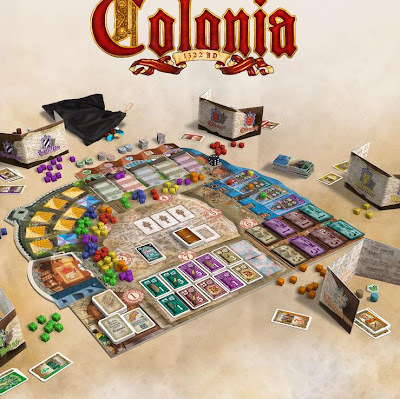 This is the game Knizia never made in the last 10 years. If you loved the depth of a game like Tigris & Euphrates and didn't mind at all the utter abstraction of the theme, then this one will be a hit with you. Can't wait to play again so I can write up a review. A game I brought back from BC this month. And boy was it missed. This strange mish-mash of bartering, majority, and second-guessing is an absolute blast. I would say it is like Adel Verpflichtet's younger, cooler brother. It's so easy, fun, and quick that you forget how god-awful the artwork is. It even has dice-rolling! 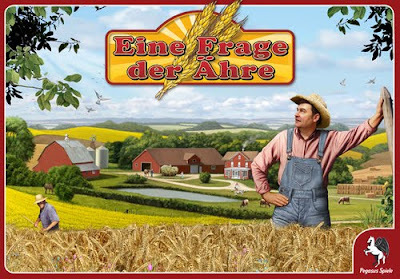 I think this one is out of print since Edel, Stein, & Reich came out which is sad because it is a classic, classic Euro. I finally got people to play this game from Uwe Rosenberg, the designer of Bohnanza, and they were all happy I did. Best memory game out there, in mind. Basically a game of making pizzas but one must remember the order of ingredients in the pile and throw their recipes in at just the right time to claim those ingredients. I'm awful at this due to my awful memory and attention span. And yet I still find it thrilling when the ingredients get laid out at the end of the round. Way more fun than it sounds and an extremely clever design. We ended the night with this 8-player deduction game. And boy, was it weird! Everyone is given a card from one of two secret factions and you want your faction to gain control of three items. Unfotunately, you don't know who is in which faction and you can't tell who has what items until you attack or trade with them. This little card game was VERY complex due to each item having some weird power to warp a game rule. In addition each player also has a unique occupation that can screw things up as well. I think if the English translations were better written on the cards, this would have made more sense but the first 30 minutes for me were utter confusion. It doesn't help that I dislike deduction games - they always feel like puzzles to me more than games, this one included. But I'd like to give it another try, definitely wouldn't buy it, though. Spent the last weekend in Toronto surrounded by superheroes, anime characters, and serial killers. I must say it was pretty surreal working a booth at FanExpo. It was a crazy busy weekend but I did a chance to take a couple pictures and check out the gaming section. Our booth selling Vince's artwork in the Festival of Fear section. Board games piled upon board games in the gaming section. More games sponsored by the Toronto Area Boardgaming Society.